Atlantic City has seen a surge in the past year in the number of boxing events held in the local casinos, and with Sports Betting now legal in New Jersey, it appears that the surge will continue. On Saturday night Main Events Promotions will promote a solid fight card at the Etess Arena at the Hard Rock Hotel and Casino in Atlantic City. 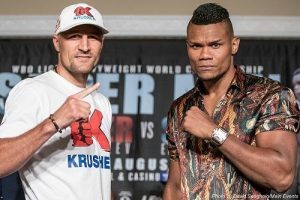 Two light heavyweight world title bouts will be featured on that card, the main event of Sergey Kovalev vs. Sleider Alvarez and the co-main event between Dmitry Bivol and Isaac Chilemba for Bivol’s title. The undercard will feature several prospects and local fighters, including Karl Dargan, Vaughn Alexander, Denis Douglin, Frank Galarza, and Bakhram Murtazaliev. The opening bout of the night will be a light heavyweight title fight between Dmitry Bivol and Isaac Chilemba. Bivol is a Russian boxer with a deep amateur background. He was Russian National Gold Medalist as well as a World Cadet Championship gold medalist. Chilemba does not have the amateur credentials of Bivol. Chilemba will have a slight one inch height advantage over Bivol. However, Bivol is the harder puncher of the two. Chilemba only has ten stoppage victories on his resume while Bivol has stopped elevent of his opponents, only two went the distance. Inactivity should be of some concern to Chilemba. He only fought once in 2018, zero times in 2017, and twice in 2016. Chilemba has also gone 1-3 in his past four fights. Bivol has been more active than Chilemba. He fought once in 2018 and four times in 2017. By his eleventh professional fight Bivol was already a world champion. Chilemba has some big losses on his resume. He has losses to Oleksandr Gvozdyk, Sergey Kovalev, Eleider Alvarez, and Tony Bellew. His notable wins include Blake Caparello, Vasily Lepikhin, Denis Grachev, and Edison Miranda. Bivol has been fairly dominant in his career. He has beaten the likes of Sullivan Barrera, Trent Broadhurst, Cedric Agnew, and Samuel Clarkson. Bivol appears to be following Sergey Kovalev’s career path and has beaten some opponents that previously faced Kovalev. Chilemba will likely be no different. Sergey Kovalev was long considered one of the top boxers in the light heavyweight division, but back to back losses to Andre Ward has faded his shine a little bit. But he’s still a very dangerous boxer and one of the top guys in the light heavyweight division. However, he’s facing one of the biggest tests of his professional career in Eleider Alvarez. Both Kovalev and Alvarez has extensive amateur backgrounds. Kovalev is a former Gold Medalist in the Russian National Championships and Alvarez represented Columbia in the 2008 Summer Olympics. Both boxers are slightly past their athletic primes. Kovalev is 35 years old and Alvarez is 34 years old. Kovalev will have a two inch height advantage and about a three inch reach advantage on Alvarez. Both boxers have been fairly active in recent years. Kovalev fought once in 2018 and twice in 2017. Alvarez fought twice in 2017 and 2016 but has yet to fight in 2018. Alvarez has defeated the likes of Jean Pascal, Lucian Bute, Isaac Chilemba, Robert Berridge, and Alexander Johnson. This writer feels this bout will be very close and competitive. Alvarez has been on a hot streak recently with some impressive wins, but has never fought someone on the level of Kovalev. If Kovalev can use his reach and height advantage well he should win this bout, but an upset wouldn’t be surprising.